How do you drive skier visits when temperatures are way above normal and people are outside in shorts in the nearest major city? You run a guerilla campaign inside the major train station hub. Posters were created to grab the attention of busy commuters, playfully letting them know that winter wasn't completely lost, while street teams handed out "ransom notes" that informed the crowds where their missing winter could be found and how much of a discount we were offering for them to enjoy it. Continuing the push for skiers in an unseasonable ski season, timely facebook updates were created on the fly to capitalize on real-time weather events. The day before a huge storm was about to hit, we gave fans the excuse to enjoy the new snow. The day after, we urged them to come up and see it for themselves. Both in a voice of a fellow true skier or rider, not as a company trying to make money. 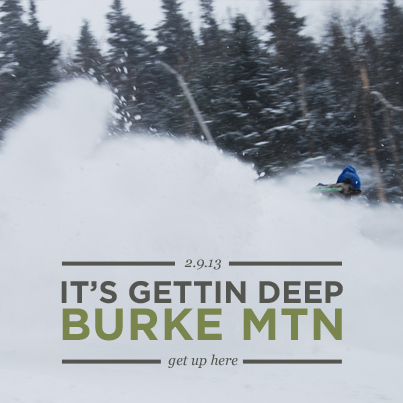 Finally, as the season was winding down, we gave one more reason to try Burke with a discounted lift ticket offer with a season pass from any other mountain. To alleviate any possible guilt about not skiing their home mountain, we gave a fun reminder that mountains don't get jealous. Campaign generated the highest number of shared posts and the more likes than all previous social efforts combined. At the end of the effort, Burke's Facebook fans had grown 170% YOY.